Pulp and paper sector capital projects have lost their competitive edge in the areas of cost and schedule performance over the last decade. These downward capital project performance trends should give the sector’s business and project organization leaders pause. Ten years ago, just as the Global Financial Crisis hit, pulp and paper companies were largely successful at delivering cost competitive and schedule advantaged capital projects, including the construction of paper mills and facility upgrades. But market demand has changed. Graphics paper consumption has declined while demand for paper-based products used by online retailers for packaging and deliveries has increased substantially. Demand for hygienic goods to meet the needs of growing world populations has risen also. Meanwhile, companies across the pulp and paper sector have been consolidating. Even as the pulp and paper landscape has changed, apparently so too have companies’ abilities, or commitments, to implement Best Practices in capital project preparation and execution. Understanding the drivers of performance difficulties and implementing IPA data-derived Best Practices in capital project preparation and execution are crucial to mill operation improvement. IPA recently examined pulp and paper sector project data to better understand what is driving the declining project trends. IPA used data from its proprietary database of 20,000 capital projects collected over the last 30 years, including data on more than 500 projects executed by 18 different pulp and paper sector companies, for its research. All project types are represented in the database—greenfield, colocated, revamp, expansion, and add-on—ranging in cost from less than $1 million to more than $1 billion. The database is invaluable in helping evaluate pulp and paper sector performance and changes in performance over the last decade and diagnose the drivers of this performance. It can also help project systems or project teams focus on improving projects using statistically developed Best Practices. IPA found that the actual cost index for pulp and paper sector projects is less competitive than the Industry average for comparable capital projects (Figure 1). The sector has seen a significant decrease in competitiveness over the last 10 years; more recent projects are 7 percent less competitive than earlier projects and 10 percent less competitive than industry average. The story is similar for execution schedule performance. 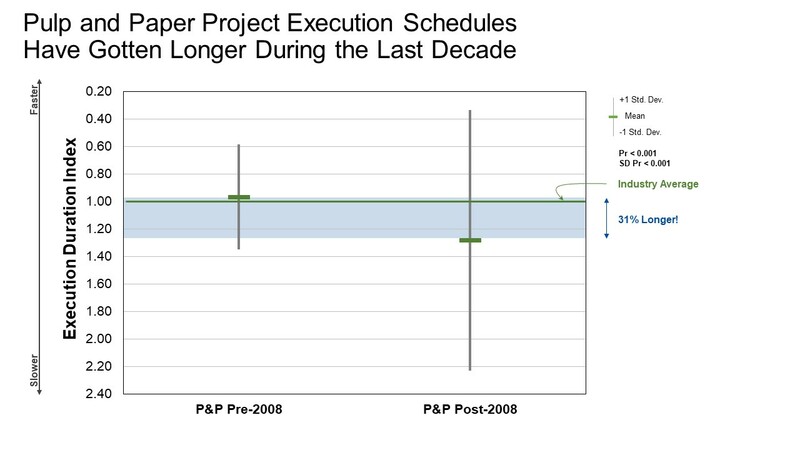 Execution schedule durations, 1 compared with similar industry projects, have also degraded over time. More recent projects average 31 percent longer durations with durations 28 percent longer than industry average, as shown in Figure 2. The graphs clearly show the decline in average cost and schedule performance in the past decade. Another key takeaway from these graphs is the recent projects’ increase in variability. 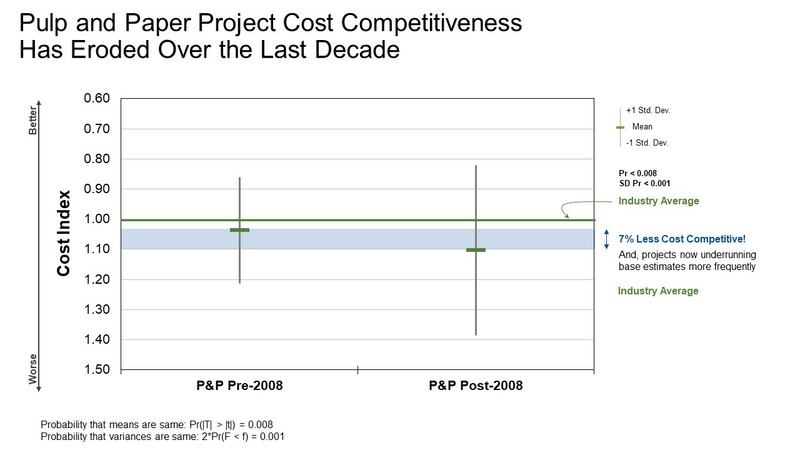 Increased variability means that while some projects have competitive costs or schedule outcomes, poor performing outliers skew the average. These bad actors fall far short of the intended return on investment. So what happened? Why has the pulp and paper sector’s average performance at delivering cost competitive and schedule advantaged capital projects floundered over the last decade? IPA found two drivers of these performance declines: (1) turnover of key project personnel, including the project manager, lead engineering, and construction manager roles and (2) diminishing use of proven project control methods. Let us first examine turnover of experienced project personnel in key functions. Recent IPA research finds that turnover is a growing concern in this era of inexperienced project personnel. Historically, the pulp and paper sector has maintained a competitive advantage in this key metric, demonstrating a lower turnover rate. But the industry has given up this advantage. IPA research determined that turnover across all processing industries adds an average of 3 percent cost growth to pulp and paper sector projects.2 However, the effect is even more marked for pulp and paper sector projects completed in the last decade. The cost of projects grows by an average of 5 percent when teams have turnover. Now let us consider project controls. IPA measures the functions and activities that enable owners to understand the status of their projects in real time. Pulp and paper sector projects do worse than industry average in project controls, with this sector’s projects completing estimate validation, physical progressing, and progress reporting statistically less frequently than other industrial sectors. Pulp and paper sector projects also assign fewer in-house owner controls personnel to projects. This is important for pulp and paper sector projects because having better project controls reduces field labor cost growth by an average of 5 percent and decreases engineering schedule slip by an average of 8 percent. Based on these data, project controls is a good investment, with the project control function adding an average of only 1.3 percent to project costs. Another notable area business leaders and project professionals in the sector should pay extra attention to during the project development process is late changes. As part of its project evaluations, IPA measures late changes—deviations from the planned configuration of a project that occur after authorization. The rate of changes has increased over time, with the average number of late changes per project more than doubling in the last decade. Maintaining team continuity and implementing project control Best Practices present opportunities to improve the performance of pulp and paper sector projects. The industry has shown its ability to catch up to industry average project performance targets before, notably in an area that is unquestionably the most important performance area—safety. Compared to other industrial process sector projects, the pulp and paper sector has seen significant safety incident rate improvements. OSHA recordable injuries reported on pulp and paper projects were significantly higher than the entire process Industry (industry average) a decade ago. During the last decade, the average for safety incidents in the pulp and paper sector decreased by almost two-thirds and is now at industry average rates. As capital activity ramps up for pulp and paper companies, emphasis on project planning and execution discipline is the only path to realize expected return on investment. Only IPA possesses the project data, capability, and experience needed for pulp and paper companies to drive improvement in capital project outcomes.